There is no question that the world we live in is a lot different than even 5 years ago. The freewheeling, big spending days are long gone. Add to that, resources are more available than ever so that, when it comes to buying something, you can quickly and easily get a lot of options. Needless to say, the salesman’s idea that “they are buying me and not the product” has taken a bit of a hit. Not that this statement is entirely untrue, because the person on the opposite side of the table/phone has a lot to do with what you ultimately decide to do, but there are so many more factors to consider. 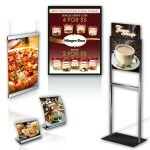 Take menu boards, drive-thrus, digital menu boards and the overall POP industry for example. An outsider would think that they could probably go to any run-of-the-mill sign company to get any one of these areas fulfilled – and to a point they are right. However what it comes down to is what you value. If you are looking for a solution that is going to benefit your business, you best work with the professionals in that given field. Last I checked, you don’t go to a doctor with an ailment and tell them what to prescribe for your pain. With that said, if you are in the market for some menu boards, the following 5 signs are a good indication that you are working with true professionals. #1 – They ask the right questions. No I am not talking about the canned questions like, “would you like backlit or front lit?” Or, “how much room do you have for the system?” Or, “how would you like to hang the menu boards?” What I am referring to are the questions that are going to make an impact. “What are your most profitable items?” “What are your signature items?” “What objectives are you trying to achieve?” This is just the tip of the iceberg. A good company will challenge some of your ideas as well. “Have you considered using pictures?” “What is your thought process behind placing them there?” In doing this, it will typically shed some light on to something you didn’t consider or will open your mind to possibilities in the future. #2 – They have industry experience. A lot of the ‘experience’ is determined by the questions they (aforementioned) ask you. Beyond that, there is a lot to be said for the length of time they have been in business. Experience is the spawn of time that allows individuals or companies to more readily handle any given situation. The reactive tone to that quote suggests that this is only a good thing when things go bad. On the contrary! Take digital menu boards for example. There are digital signage companies popping up everywhere. From software platforms that took millions to produce, to solutions that were developed in someone’s basement. A company that has been involved since its inception would be far and away the best equipped to discuss the benefits and shortcomings of a number of different options. #3 – They have a diverse product line to meet your needs. Let’s put the earthy, crunchy stuff aside for a moment and focus on the products themselves. You should never have to feel pigeonholed in to a solution. A good company should be able to consider all of your objectives and budget and offer a product that works. That being said, no one can be everything to everyone. Should that be the rare case, they should at least be able to give you some suggestions on where to find what you are looking for. #4 – They have worked with reputable companies. If you are starting up and have the dreams and ambition to become a multi-million, multi-unit concept, wouldn’t you like to know that the company you are working with could accommodate that? Ok, so that rationale may be a little too “pie-in-the-sky” for now, so it may make more sense to look at it in different light. What do large companies have that small companies do not? (The answer I am going for isn’t money.) PERSONNEL! These companies have buyers, VP’s of Marketing, VP’s of Operations, VP’s of IT and sometimes even CEO’s that weight in on menu board decisions. Isn’t it nice that their millions of dollars in payroll that is being applied to their “due diligence” can be yours for free? #5 – They are in-tune with what the market will bear. A part of any successful company is market research. This isn’t always limited to the products and services they offer but also to the field in which they play. In the menu board industry there are a lot of similarities between indoor backlit menu boards, indoor non-illuminated menu boards, drive-thrus, etc. A lot of people think the same about digital menu boards, but they couldn’t be more incorrect. (This has no bearing on the point I am trying to make, so I digress…) If company A, B and C are selling a straightforward magnetic menu board for $395 and company D is selling it for $585, this should serve as a warning that they probably aren’t in-tune with the market on many levels. On the flip side, if there is a company offering the same board for $195 this is also cause for concern. CHEAP in this case = poor quality! Basing your menu board decisions strictly on cost could be prohibitive to the success of your restaurant. If you don’t find yourself contemplating the answers to questions that you have never considered, you’re probably talking to the wrong company. The fact that a menu board company has been around for a while and has worked with some reputable companies is a good sign that they meet high standards. It is concerning in both situations when you are considering a particular type of solution from a number of companies and one happens to be much more expensive or much less expensive.